How many times have you heard that? Reason is, it’s true. I recall when I was looking to sell my business a few years ago that the only thing people were interested in before anything else was the size and quality of my database. Why? Because that is whom you market to: it’s where your money comes from. Same in the online world. So pretend you’re at school and write that statement out a hundred times until it is second nature! To help you build your list, here are 7 tips for you. • How do you know what THEY find relevant? • Review your stats – what have people viewed most on your site? • How many subscription boxes are on your sites? Think about where best to put them but have more than one lonely one! • Can you offer past issues of a newsletter or a chapter of a book or something similar? • Better yet create a solid product that people will think “wow” – a compilation of your past best blog posts, a set of interviews you’ve had with industry leaders, think larger than usual. • People may even be prepared to buy it. Great ideas for list building. I’ve recently implemented a few of these, and they have made a difference in sign ups for sure. Wonderful! It’s great you’re seeing results already. Love that you can use them! This was a great article with so much valuable information. 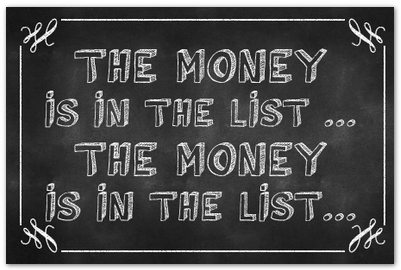 So many of us struggle with not knowing how to build a list. You’ve provided a lot of ways in which to do just that. Glad you found it useful, Cynthia. Thanks for taking the time to pop by. These are great tips, Mel. You’re giving me a lot to think about for the next month when I finally get my email list up and running. Terrific! The key is not to rely on one method. Best of skill with your list building.